Born in 2000, St. Petersburg. He studied at the Children's Music School No.11 of St. Petersburg Vasileostrovsky District (Class of Teacher Lyudmila Artamonova). He is currently studying the Secondary Special Music School at the St. Petersburg Rimsky-Korsakov Conservatory (Class of the Honored Artist of Russia, Professor Alexander Sandler). He participated in master classes with Dmitry Bashkirov, Efrem Briskin, Alexander Braginsky, Pavel Nersesyan, Alexander Kobrin, Anthony Newman and Matteo Cameron. 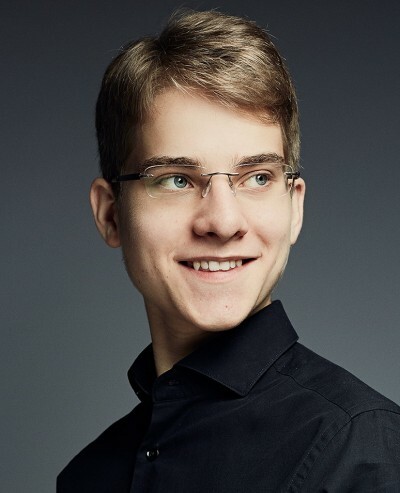 Participant of the festival "Faces of Modern Pianism" (St. Petersburg), David Oistrakh Festival (Sillamäe), Summit Music Festival (New York), International Music Academy (Tuscany).